Is your 2011 New Year's Resolution to get fit and healthy? Head out to the 'green gym' this New Year! There is nothing better than a long walk in Britain's beautiful countryside - you not only burn off calories (up to 400 an hour! ), but you also give your body a total workout - physically, mentally and spiritually; walking in the Great Outdoors is simply great for your mind, body and soul. But do you have the skills to plan your own walks and then navigate safely (using a map and compass)? 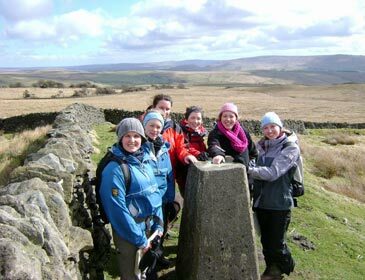 We offer 1 & 2-day Navigation Skills Courses in the Yorkshire Dales, North York Moors and Peak District throughout 2011, including National Navigation Award Scheme (NNAS) Bronze, Silver and Gold levels. Gain a national award! Explore further and step out with confidence in 2011! ONLY £99 per person for our 2-day courses or £49 for our 1-day courses. Ingleby Greenhow, North York Moors. 4 miles / 2 hours. Ingleby Greenhow is a delightful village that lies just within the boundary of the North York Moors National Park. It is dominated by the great arc of the Cleveland Hills that sweep round in sinuous curves to the east and south of the village, sheltering it from easterly winds. The name of the village may be derived from the Danish words ‘Ingleby’ meaning ‘village of the English’ and Greenhow meaning ‘green hill’ – it is certainly surrounded by green hills, although the day I walked this route everything was completely white with snow. On the edge of the village stands St Andrews Church, a beautiful low, stone building that dates back to the 12th Century when it belonged to the monks of Whitby Abbey, although a church may have stood on this site in Saxon times. It was largely rebuilt in 1741. This walk heads into the deep recess known as Greenhow Bottom that cuts into the Cleveland Hills creating an impressive amphitheatre of hills around a basin of fields and a scattering of farms that rarely see sunlight in the winter months. Field paths and quite lanes lead into Greenhow Bottom before a path drops down over a footbridge across Ingleby Beck then up to join a track along the foot of the steep escarpment of Ingleby Bank. Remarkably, this track was once a railway line that was built in 1861 by the North Eastern Railway Company to transport ironstone from Rosedale in the heart of the North York Moors to Teesside. This amazing feat of engineering followed the contours of the hills perfectly for eleven miles from the moors above Rosedale, around the head of Farndale to Incline Top above Ingleby Greenhow from where loaded goods wagons were lowered down a 1-in-5 incline from the escarpment of the Cleveland Hills to join the main line at Battersby Junction. At its height during the 1870s over 300,000 tons of iron ore was transported by rail to Teesside annually, peaking at over 560,000 tons in 1873. The mines closed following the General Strike of 1926 and three years later the last train was lowered down the Incline. Our route joins this old railway about a kilometre north of the foot of the Incline and then follows the track-bed for almost two kilometres to reach Bank Foot. Bank Foot was once an important location along the ancient highway between Kirkbymoorside and the villages of Cleveland via the moorland ridge of Rudland Rigg; above these farms this old ‘Coach Road’ winds steeply up Ingleby Bank onto the Cleveland Hills from where it headed south across Rudland Rigg. Photos (copyright Mark Reid) - the photo-files are named. Yesterday, Jon Mitchell (ITV's weatherman) and I went out to Holme in the upper reaches of the Holme Valley, near Huddersfield, to film our latest TV walk for ITV Yorkshire. We walked a 5-mile route, taking in Brownhill and Marsden reservoirs as well as Cliff Road. It was a picture-perfect Christmas walk with loads of snow on the ground, as well as waist-deep snow drifts as we found out on the moors around Cliff Road. The walk was finished off at the Fleece Inn at Holme (great village pub in the heart of the Yorkshire Pennines), where the local brass band greeted us with Christmas carols. TeamWalking will be at the 2011 Outdoors Show at Excel, London between the 13th - 16th January. We will be on the Welcome to Yorkshire stand. My latest ITV walk with weatherman Jon Mitchell is now online. This month, we head up onto the moors above Haworth in search of Wuthering Heights. Spent last week at Plas y Brenin (National Mountain Centre) in Snowdonia where I completed the Mountain Leader (summer) training course. Superb venue, magnificent mountains, great food/accommodation and very knowledgeable and experienced instructors. I learnt a great deal, which I'll now put into practice before going back to Plas y Brenin for my ML assessment in spring next year. Mountain days included: Moel Siabod, Glyder Fawr (via Y Gribin) and a 2-day expedition and wild camp across the Moelwyns. Completely updated, re-walked and revised, this new edition features more information, text and revised route descriptions (with Grid References) as well as an 8-page colour photograph section and a new cover, re-branded as The Ultimate Pub Walks. Just imagine it... a crisp December morning, a wonderful winter walk in the Yorkshire Dales, mince pies on the hillside, crackling log fire and a 2-course Christmas lunch at the Devonshire Hotel, Grassington. Use of our Berghaus gear if required. Limited places. Once payment has been made a Booking Form will be sent to you. Over 18s only. Tea/coffee and Christmas Lunch at the Devonshire Hotel, Grassington. Another great Walking Festival last weekend. Over 430 walkers came up to Wensleydale to enjoy a weekend of great walks, classic pubs and evening entertainment. After a very wet Friday, the weather improved with sunshine and squally showers. There were 14 self-guided walks to choose from, varing from 4 to 15 miles in length, and everyone who set off came back safely having had a great time. But there again, you can not help but be impressed by the stunning landscapes of the Yorkshire Dales. We also raised over £800 for Swaledale Mountain Rescue Team, who were on standby over the weekend (but thankfully were not called upon!). I researched and wrote all of the walks - over 120 miles of paths - which took me the best part of the summer. On Friday I took an Open Access navigation skills walk up to the summit of Dodd Fell (668m), which was challenging due to the weather and terrain, but hugely enjoyable. Spent yesterday morning with a group of business professionals in the North York Moors. Had breakfast at the Inn at Hawnby, then went for a 6 mile walk across the heather moors and finished back at the pub for lunch. There was time to talk, think and network with like-minded people. Just started a NetWalking group on LinkedIn as well, which will help everyone keep in touch. The heather is blooming so it was a great time to be out on the moors above Swaledale.